1Chemistry Department, CAC-UFG, Catalão, Goiás, Brazil. 2Clinical Analysis Department, School of Pharmaceutical Sciences, Araraquara - UNESP - São Paulo State University, São Paulo, Brazil. 3Pharmacy Department, Guararapuava - UNICENTRO - Paraná, Brazil. 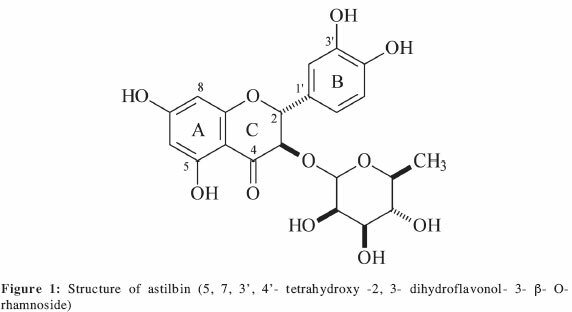 Astilbin (5,7,3',4'-tetrahydroxy-2,3-dihydroflavonol-3-ß-o-rhamnoside), a flavonoid with a large range of biological activities, was isolated from Dimorphandra mollis, a shrub common to the Brazilian Cerrado. The purpose of this study is to verify the effects of astilbin on myeloperoxidase (MPO) and horseradish peroxidase (HRP), and its antioxidant activity against hypochlorous acid (HOCl) and total antioxidant activity (TAC) by the 2,2'-azino-bis(3-ethylbenzothiazoline-6-sulfonic acid) radical cation (ABTS+). Astilbin inhibited MPO and HRP activities in a concentration-dependent relationship and effectively scavenged HOCl. The TAC by ABTS+ of astilbin (IC50 ~ 20 mM) was higher than that of uric acid, which was used as a positive control. These data demonstrate that astilbin is a potent antioxidant and that it inhibits MPO and HRP activities efficiently. Key terms: Astilbin, Myeloperoxidase, Horseradish peroxidase, Reactive Oxygen Species, Hypochlorous acid. Dimorphandra mollis Benth. (Fabaceae, Caesalpinioideae) (Lorenzi, 1992) is a very common tree that thrives from southern to western Brazil. There is no evidence that this species lives elsewhere in the world. Some species are popularly known as "barbatimão". Stryphnodendron adstringens, S. polyphyllum, and S.obovatum are known as "true barbatimão", and Dimorphandra mollis, as "false barbatimão". Although they belong to different genera, some species are sympatric (similar blooming period) and are commonly confused. Barbatimão (Stryphnodendron sp or D. mollis) is extensively used in folk medicine for the treatment of diarrhea, gynecological problems, and for healing wounds. Previous studies showed significant cicatrizing properties (Panizza et al., 1988; Jorge Neto et al., 1996, Landrault et al. 2002, Lopes et al., 2005), anti inflammatory activity (Lima et al., 1998), and gastric anti-ulcerogenic properties (Audi et al., 1999) of the crude extract of the stem bark. Use of barbatimão species as an antioxidant has not been reported. The production of reactive oxygen species (ROS) by active neutrophils and the release of oxidants may be a contributing factor in the progressive decline of immune system activity in patients with diabetes, emphysema, atherosclerosis, and cancer (Clark, 2002; Giordano, 2005). The generation of ROS by neutrophils involves the enzymes NADPH oxidase and myeloperoxidase (MPO). The NADPH oxidase system generates a superoxide radical (O2 -), and after dismutation catalyzed by superoxide dismutase, H2O2 is generated. MPO utilizes H2O2 to oxidize chloride, resulting in the formation of the pro-inflammatory oxidant, hypochlorous acid (HOCl), a microbiocidal responsible for the oxidation of several biological substrates resulting in tissue damage. The anti-inflammatory activity of many drugs and natural compounds has been attributed to the inhibition of MPO. Evidence suggests the association between MPO levels and the risk of coronary diseases, pointing to MPO as an inflammatory marker (Zhang et al., 2001). Epidemiological studies indicate that increased consumption of fruit is associated with a decreased risk of degenerative cancer (Beecher, 1999) and that secondary metabolites present in natural food sources are responsible for this (Liu, 2003). The protective action of some foods, such as fruit and vegetables, against degenerative diseases has been attributed to their antioxidants, particularly those rich in phenolic compounds. Astilbin (5,7,3',4'-tetrahydroxy-2,3-dihydroflavonol-3-β-O-rhamnoside) (Figure 1) has been associated with a large range of biological activities, such as lowering total cholesterol in the liver (Igarashi et al., 1996), protection against oxidative damage to the mitochondria and erythrocyte hemolysis in the liver (Haraguchi et al., 1996a), inhibition of aldose reductase (Haraguchi et al., 1996b), enhancement of the vanadate-stimulated release of lipoprotein lipase (Motoyashiki et al., 1998), hepatoprotecting effects in rats (Closa et al., 1997) and mice (Xu et al., 1999), antinociceptive and anti-oedematogenic effects (Cechinel-Filho et al, 2000), induction of apoptosis (Yan and Xu, 2001), and suppression of lymphocyte functions (Cai et al., 2003). Recently, our group reported that astilbin is toxic to various insects (Cintra et al., 2002; Pereira et al., 2002; Cintra et al., 2005a, 2005b). This paper reports the inhibitory effects of astilbin on MPO and horseradish peroxidase (HRP) activities, as well as its antioxidant properties. Based on reports on the redox properties and antioxidative activities of flavonoids, as well as on the fact that peroxidases have been shown to oxidize those compounds, we studied the interaction of astibin with HRP and MPO and its major reaction product, HOCl. Human MPO was purchased from Planta Natural Products (Austria). HRP, guaoacol, H2O2, 5,5'-dithio-2-nitrobenzoic acid, sodium borohydride, NaOCl, and ABTS were purchased from Sigma (St. Louis, MO, USA). All the other chemicals were of analytical grade and of the highest commercially available purity. The concentration of HRP was determined as described in the literature (Gazaryan et al., 1996). HOCl was obtained by diluting NaOCl in 5 mM NaOH. The dilute concentration was determined spectrophotometrically (e292 = 350 M-1 cm-1). Flowers of Dimorphandra mollis Benth. were collected in São Carlos, São Paulo State, Brazil in January 2004 and dried in an air circulation oven (40 oC) and later milled. The extraction, purification, and characterization of astilbin were previously described (Pereira et al., 2002). Flowers (450 g) were extracted three times with dichloromethane, followed by two extractions with methanol, yielding 7.5 g and 34.1 g, respectively. The methanol extract yielded astilbin after HPLC separation on a polymer-packed column (Shimadzu, Asahipak GS-310 P, 21.5 cm ID x 50.0 cm L) eluted with methanol (flow rate: 7 mL min-1, UV detection at 290 nm), yielding whitish yellow crystals (7.6% w/w of the dry starting material), m.p. 190-191 °C; APCI/MS m/z = 451 [M + H]+; NMR data were compared with literature data (De Brito et al., 1995). (range 0 from to 22.5 μM). The mixtures were incubated at 37 °C, and the reactions were initiated by the addition of H2O2, followed by recording the increase in absorption at 470 nm for 3 min. MPO and HRP activities were calculated from the initial rate of the reaction (in seconds). The transition of native HRP (403 nm) to compound I was followed at the Soret maximum of compound I (408 nm), and that of compound I to compound II was followed at the Soret maximum of compound II (420 nm). In a typical experiment, HRP (2 mM heme) in a 50 mM buffer (pH 7.4) was premixed with 0.1 mM of H2O2. After a 5-s delay, compound I was reacted with astilbin (45 mM) and was monitored for 3600 s.
The synthesis of 5-thio-2-nitrobenzoic acid was carried out according to Ching et al. (1994). Briefly, a 1-mM solution of 5,5'-dithio-2-nitrobenzoic acid (DTNB) in 50 mM potassium phosphate buffer (pH 6.6) containing 50 mM sodium EDTA was added to a 20 mM solution of sodium borohydride. The solution was incubated in the dark at 37 ºC for 30 min. The concentration of TNB was measured at 412 nm (ε = 13.600 M-1.cm-1). 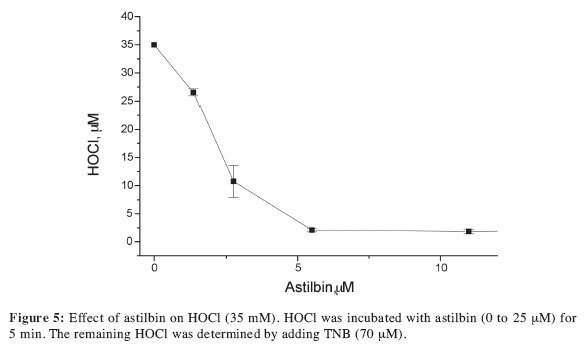 HOCl (35 mM) was incubated either with or without astilbin (0 to 25 mM). After 5 min, TNB (70 mM) was added and the concentration of the remaining HOCl was determined spectrophotometrically (l = 412 nm). 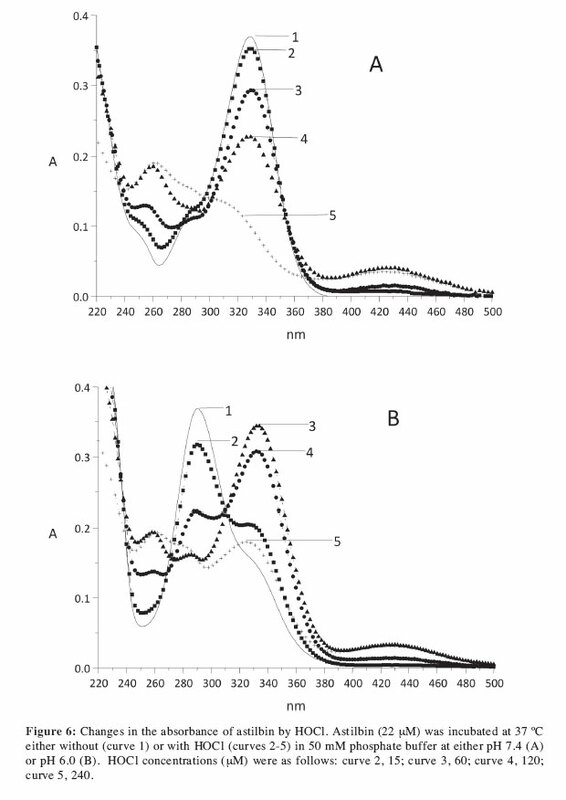 Solutions of ABTS (7 mM) and potassium persulfate (2.45 mM) were mixed and incubated in the dark at room temperature for 12-16 h (Re et al., 1999). The product, ABTS+, was diluted in ethanol for optimal absorption ± 0.7 at 734 nm. The reduction between ABTS+ and astilbin was monitored by a decrease in absorption at 734 nm after 30 minutes. This decolorizing assay was also applied for uric acid as a standard. ABTS+ inhibition % =[(Ab-Aa)/ Ab]×100; where: Ab: absorption of the control, and Aa: absorption of the sample (astilbin or uric acid). As shown in Figure 2, astilbin decreases the rate of oxidation of guaiacol, indicating that it acts as an MPO substrate. In this system, either MPO or HRP (an enzyme used as a model for peroxidases) is converted into compound I in the presence of H2O2, followed by the oxidation of guaiacol and the formation of compound II. Compound II promotes the oxidation of another guaiacol equivalent and returns to its native state. 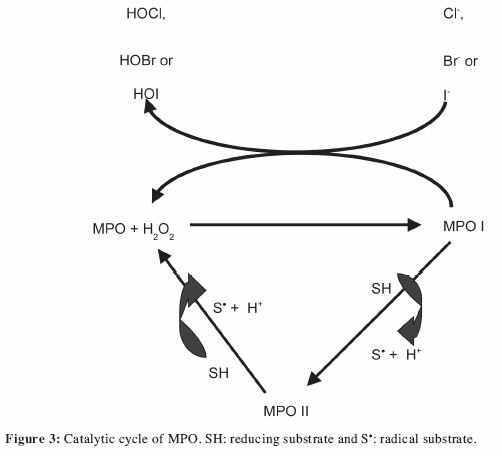 Alternatively, MPO I catalyzes the oxidation of halides, generating their respective hypohalous acids (Figure 3). The interaction between flavonoids and peroxidases (HRP) has been well studied. Kostyuk et al. (2003) and Awad et al. (2000) reported that flavonoids can act as MPO and HRP substrates. According to our results, astilbin may interact with oxidized intermediates MPO I and/or MPO II, leading to decreased oxidation of guaiacol. 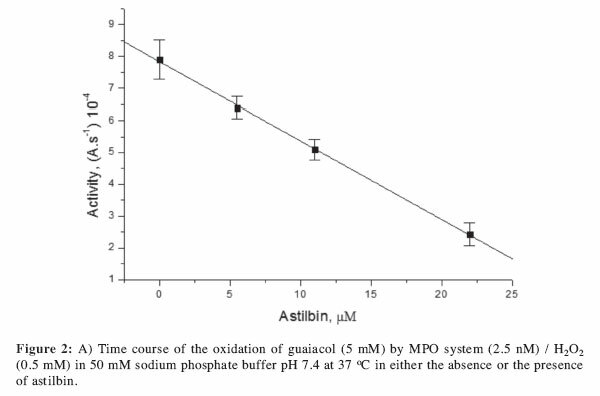 It is interesting to point out that the concentrations of astilbin (11 and 22 μM) used in this assay was much smaller than those used with guaiacol (5 mM), showing its significant effect on the inactivation of MPO. 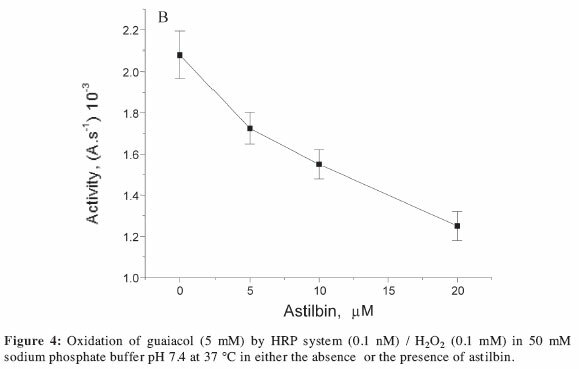 Figure 4 shows the effect of astilbin on the oxidation of guaiacol by HRP. Astilbin presented a low inhibitory effect on HRP (% inhibition: from 25.5 to 10 μM and from 40 to 20 μM) in comparison with MPO (% inhibition: from 37 to 10 μM and from 69.3 to 20 μM). The conventional peroxidase cycle is known to oxidize various substrates with the consumption of H2O2. In the presence of H2O2, the native form of the enzyme (FeIII) is converted into Compound I (heme with FeIV=O plus porphyrin radicals), which catalyzes the oxidation of substrates by converting itself into Compound II (FeIV=O). Compound II also catalyzes the oxidation of substrates while converting itself into its native form, completing the peroxidase cycle. The native enzyme is monitored at λmax= 403 nm, Compound I at λmax= 408, and Compound II at λmax= 420 nm. 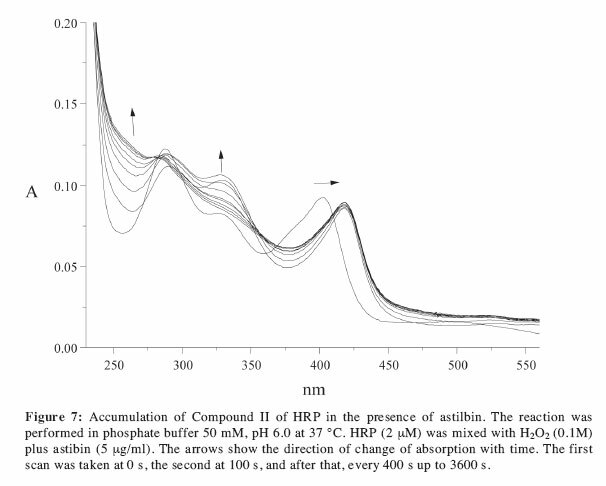 The kinetic data for the reaction of HRP-H2O2 in the presence of astilbin are shown in Figure 7. Compound II is formed in the HRP-H2O2-astilbin system, which indicates that astilbin is not an efficient substrate for Compound II; thus, the peroxidase cycle (native return) cannot be completed. Simultaneously, the astilbin spectra presented absorption changes despite the accumulation of Compound II in this step. The reaction between HRP-H2O2 and catechin resulted in dimeric products (Hosny and Rosazza, 2002). The literature reports that peroxidase transfers one-electron oxidation of flavonoids, leading to the formation of several products (Awad et al., 2000), which may be attributed to the presence of multiple hydroxyl groups. Figure 5 presents the results of the HOCl scavenger assay. In this assay, HOCl scavengers compete with TNB for HOCl and are monitored by a decrease in the absorption at 412 nm. Incubation of astilbin with HOCl reduced TNB oxidation, indicating that a low concentration range of astilbin acts as a HOCl scavenger. A similar effect was reported using quercetin (Binsack et al., 2001). An astilbin concentration of 5 μM resulted in a decrease of approximately 94% of HOCl (35 μM) (seven times as high as the concentration of astilbin), demonstrating its effective antioxidant effect on HOCl. The interaction between HOCl and quercetin generated stable mono- and dechlorinated derivatives that exhibited enhanced antioxidant potential (Binsack et al., 2001). To elucidate the scavenging reaction mechanism of astilbin with HOCl, the interaction between the two compounds was evaluated based on spectral changes. Astilbin (pH 7.4) presents a peak at λmax = 280 nm. We observed a hyperchromic effect at λ = 260 nm and λ = 430 nm, followed by a hypochromic effect at λ = 328 nm, and an isosbestic point at 290 nm (Figure 6A) when HOCl (30-240 μM) was added to the astilbin solution (20 μg/mL). A similar experiment at pH 6.0 showed a peak at λmax = 290 nm, and after HOCl was added, there was an increase in the absorption at 255, 342 and 430 nm, a decrease at 290 nm, and isosbestic points appeared at 270 and 312 nm (Figure 6B). Figure 8 shows the results of the ABTS+ assay. The degree of discoloration indicates that the scavenger has antioxidant activity. 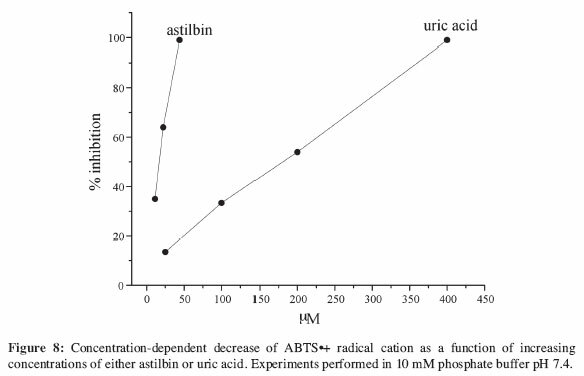 In comparison to uric acid, an endogenous antioxidant present in extra cellular fluids (Stinefelt et al., 2005), astilbin presented a higher antioxidant capacity (IC50 ~ 20 μM). Uric acid is the final product of the metabolism of purine (Machin et al., 2004) and it is a relevant indicator of the total antioxidant capacity of human plasma. Flavonoids are probably the most studied and the best-known natural substances present in vegetables that have antioxidant and anti-inflammatory properties. Recently, attention has been focused on the use of flavonoid-based drugs in the prevention and therapy of free radical-mediated human diseases. Flavonoids are excellent radical scavengers, a property that is related to their oxidation/reduction potential and activation energy of electron transfer (Havsteen, 2002). The release of ROS by phagocytic leukocytes depends on the activation of NADPH oxidase and MPO. MPO is an abundant component stored in azurophilic granules of neutrophils that catalyzes the generation of HOCl, a reactive chlorinated intermediate that is also involved in oxidative complications. The formation of ROS serves as a host defense mechanism, but it is also clear that ROS are related to the development of diseases. The oxidation of low-density lipoprotein (LDL) by MPO and HOCl has been implicated in the development of atherosclerotic lesions (Kostyuk et al., 2003; Mertens and Holvoet, 2001). Several studies have been aimed at elucidating the interactions between peroxidases and flavonoids, but few have dealt with MPO. It was demonstrated that flavonoids with either the catechol moiety or a,p-unsaturated carbonyl with the free hydroxyl group at C-3 have shown the best MPO inhibitory properties (Regasini et al. 2008). HRP catalyzes the oxidation of flavonoids to free phenoxyl or semiquinone radicals (Awad et al., 2000). Quercetin radicals were detected during the interaction of quercetin with HRP-H2O2, indicating oxidation by one electron transfer (Miura et al., 2003). Astilbin demonstrated an inhibitory effect on the activity of MPO (IC50 ~15 μM). In our experiment, we used a high concentration of guaiacol (5 mM) in relation to astilbin (μM). This shows that astilbin is an efficient inhibitor under peroxidase activity. The direct interaction between astilbin and intermediate peroxidase products at different absorbance peaks may be due to the presence of several hydroxyl groups (Kostyuk et al., 2003). Phenolic compounds from grapes and in wines can protect against oxidative damage and may prevent the development of atherosclerosis. The proposed mechanism for this correlation involves the antioxidant properties of flavonoids. The intake of polyphenols in the diet has been associated with a low risk of coronary diseases (Hertog et al., 1995). The literature supports the association of the beneficial effects of a diet rich in fruits, vegetables, tea, and red wine with the presence of polyphenol antioxidants (Urquiaga and Leighton, 2000; Yao et al., 2004). Flavonoids scavenge free radicals by donating hydrogen atoms to radicals (Rajendran et al., 2004). Pharmacokinetic studies in animals have demonstrated that pure astilbin presents a rapid oral absorption profile and longer t1/2 (Guo et al. 2004, Liang et al. 2009). This means that astilbin in the diet can provide interesting benefits. These pharmacokinetic characteristics might be helpful for exploring the effective mechanisms of astilbin and its related compounds in vivo. The substitution patterns in flavonoid rings either increase or decrease antioxidant activity. The 3',4'-orthodihydroxy configuration in ring B and the 4-carbonyl group in ring C has radical scavenging activity (van Acker et al., 1996). The presence of a sugar moiety increases antioxidant activity more than the hydroxyl group in carbon 7 (Rajendran et al., 2004). Therefore, several features of the astilbin structure (Figure 1) make it a strong antioxidant agent, as confirmed by our results. Our results suggest that astilbin possesses a high antioxidant effect, as seen by its action on ROS (HOCl and·O2-), TAC activity, and dose-dependent inhibition of the activities of MPO and HRP, which could exert beneficial effects in several pathologies. The straightforward extraction and purification of astilbin from D. mollis flowers shows that they could be a good source of this compound. The authors would like to thank Coordenação de Aperfeiçoamento de Pessoal de Nível Superior (CAPES) and Conselho Nacional de Desenvolvimento Científico e Tecnológico (CNPq, Process 475879/2008-2. * Corresponding Author: Prof. Dr. Najeh Maissar Khalil, Departamento de Farmácia, Setor de Ciências da Saúde, Universidade Estadual do Centro-Oeste  UNICENTRO, Rua Simeão Camargo Varela de Sá n. 03, Guarapuava  PR, Brazil 85040080, Phone: 55 42 3629 8137, FAX: 55 42 3629 8102. E-mail: najeh@unicentro.com Najeh Maissar Khalil3, Fernando Petacci1*, Silvia de Sousa Freitas1, Iguatemy Lourenço Brunetti2. Received: 04-05-2009. In revised form: 23-08-2009. Accepted: 01-09-2009.